Blogging wedding pictures is so much more time-consuming and challenging than my usual naturey crap and food/coffee shots! After way too many hours, I still barely have any people shots in this post. Hopefully I can get my act together and muster up another post for those. For now, I will at least share some getting-ready and detail shots. I think the hardest part of this wedding for me, by far, was not having any natural light. I hadn't touched a flash in my life (okay except for the times I assisted on weddings last year) for any of my personal work, but I had to practically completely rely on one for this wedding, which took place at nighttime and indoors. I went purely on a bit of trial and error with the diffusing and angle of the flash, and figuring out which way to flop it when switching from landscape to portrait and vice versa was always a pain and definitely slowed me down a bit. Still, I felt oddly comfortable and unstressed for most of the wedding. In fact, I felt MORE stressed when I was an assistant last year. I think this time, it was mostly because I was just shooting a less formal reception that wasn't a full-day affair. Plus the bride and groom were amazingly cooperative and patient, and just plain nice people. I greatly appreciated that. I was pretty excited about all the traditional clothing and chunky jewelry. There were some fantastic colors among the women's garb. 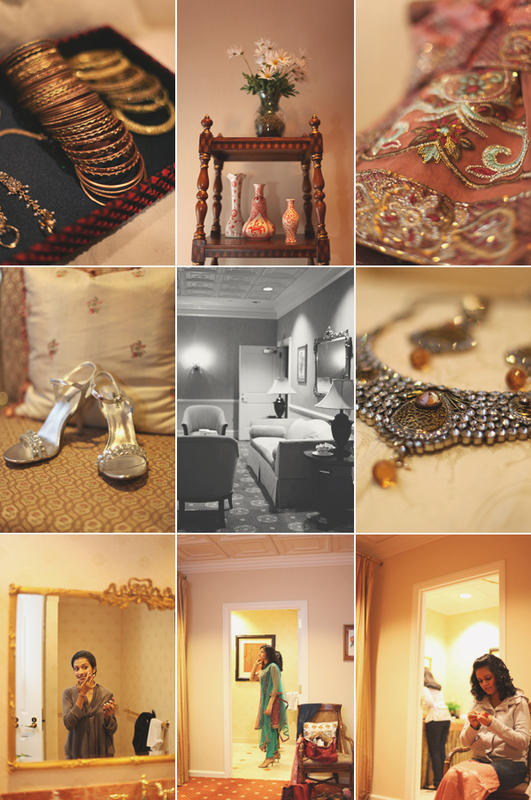 Divya was a beautiful bride who made my job easy. As I've said many times before (and is pretty obvious throughout my blog), these kinds of shots are just smack there in my comfort zone. People...well, I'm still working on that. All in good time. Great details. It's awesome that there were traditional(?) Indian things to make it stand out. Dang. That is one gorgeous bride! I'd love to photograph someone wearing all that jewelry, too! She was such a lovely bride! And shooting indoors can be so very challenging. Flash is something that I definitely have to learn. You did a really beautiful job :) I wouldn't have a clue about using flash so am super impressed with your results! Nice job! People; what's wrong with your "people?" Wow Alice I think you did a great job!